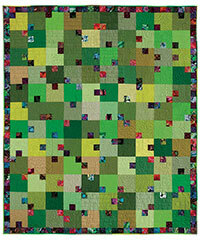 Mint Julep Quilt Kit on Sale! My Mint Julep Quilt Kit is on Sale at Quilt ‘n Sew Shop! If you’ve been thinking of making this pattern but haven’t had the opportunity yet, why not buy the fabric and pattern all together in a kit? Check out their online shop for my Mint Julep quilt…it’s on sale now! PS… I’m not associated with these guys, nor do I get any proceeds from the sale of their quilt kits.